Goddess Saraswati is the Chief of Education, Knowledge and Creativity. She can unearth the finest qualities in you and sharpen your skill sets. The Saraswati yantra is energized with geometric patterns that can empower you with the Positive Energy of Saraswati. This positivity can gift you with knowledge, mental power and innovative thinking. Wisdom is the essence of life. Attaining wisdom is a never-ending process, and it cannot be complete without the guidance of divine power. Saraswati is the Mother of wisdom and imagination. She stimulates your thirst for knowledge and quenches it with wisdom, too. 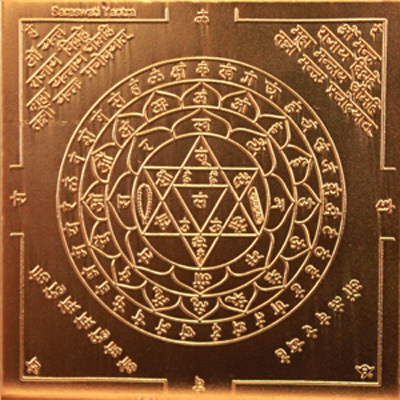 Your sincere prayers to the Saraswati Yantra can guide you to experience the creative side of your life.